Eastercon time again! So I will be here on Friday & Saturday 25th-26th of March. Sadly I was a bit late in registering so you won’t see my mug on any panels this year but you’ll probably see it in the bar so come and say hi if you’re around! Progress report: 9 months, 125k-ish words, and I am just about halfway on my new book. Epic fantasy is epic. Who knew? Ask Me Anything on Tuesday 8th! I will be doing an AMA (Ask Me Anything) session on Reddit Fantasy on Tues 8th. I’ll be popping in and out all day (UK time) to answer questions, so if there’s anything you have a burning desire to know or say, bring it on! 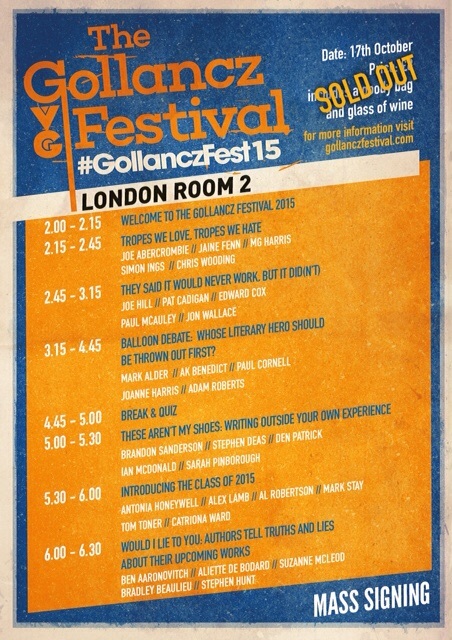 GollanczFest 2015 tomorrow! Yay! So in the meantime I’ve been slaving on my WiP. That’s Work in Progress for those who don’t deal in acronyms. I live in London, we’re too busy to use complete words here in the big city – or the BC, AWLTS (as we like to say). I’m just making stuff up now. So, news is I am 73,000 words in – almost exactly the length of Velocity – and I’m probably only a quarter way through. Two fifths at most. This is gonna be a big book. And it’s the first of a planned three. Obviously my last epic fantasy wasn’t epic enough. Seriously though, I’m having a great time writing it. Can’t believe I’ve been doing this professionally for like twenty years and I’ve never actually attempted a quote-unquote ‘Western’ (i.e. vaguely European-feeling) fantasy. Broken Sky was all anime-style and had the conceit that everyone had a superpower. The Braided Path was also much more influenced by Japanese and Chinese culture. I grew up on books like Shannara, Dragonlance and obviously Lord of the Rings and while this book, I stress, is not really much like any of them, it at least comes from the same region. Writing an epic fantasy in the traditional mould is like coming home. Except obviously it won’t actually be traditional. You know me by now, right? This! This! I will be here! I’m happily tapping away through über secret fantasy novel, having a lot of fun with it. Think it’s gonna be a long ‘un, though: already looking like it’ll end up bigger than any of the Ketty Jay books! But it’s epic fantasy, right? Whatchagonnado? I’m hoping to get a proper update done on the site soon, add Velocity to the books and maybe remove some redundant parts like the Press section (which hasn’t been updated since the King James Bible first came out) and the Forum which is sadly deader than Pluto’s hopes of becoming a planet again. Next year I shall also be attending Eastercon in Manchester and Nine Worlds in London, as by that time I ought to be able to tell y’all something of what I’m working on. My God, it’s an Update!!! I know, right? But here it is, and here’s the skinny. First up, I’M ON TWITTER. You thought it’d never happen, but it did. Befollow me on @_ChrisWooding_ where you can hear splurts of random communications involving whatever I just tripped over that morning. It’s better than waiting for my tri-yearly posts up on here. In other news, I am embroiled in a deeply secret project about which I can say a few words only. It is a novel. It is a fantasy novel. It is a fantasy novel that actually resembles a fantasy novel instead of being about, like, some weird skewed kind of pseudo-scipunk-bizarro world that just gets put in the fantasy category because nobody knows what the hell else to do with it. When there’s something to officially announce, there’ll be one of those official announcement things, but it won’t be for a while yet. In the meantime, content yourself that I am writing, have been for a while actually, and that there are more books on the way. And I’m very very excited about getting back to scribbling again. 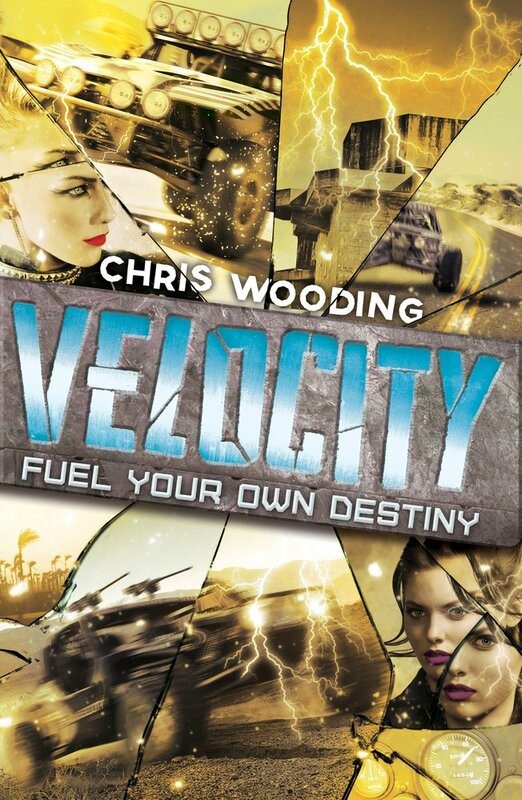 Velocity cover and Gollancz Festival 2015! 2nd July in the UK, people! Order it here. Or here if you’re buying from overseas. Also, also! 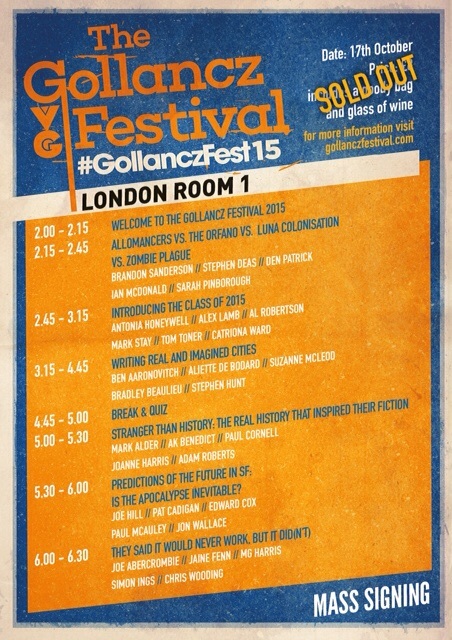 The Gollancz Festival is back! Now in two cities, Manchester on 16th Oct and London on the 17th. After the big bowl of awesomeness that happened last time, I’m looking forward to it! I’ll definitely be at the London one and possibly the one in Manchester too. Will keep you all updated. To tide you over till next time, here’s a bunch of goats singing the Game of Thrones theme tune! To tide you over, here’s a lovely Pinterest board of the Ketty Jay characters and aircraft, and an amazing concept art piece depicting Retribution Falls. One day I’ll have my own calendar! One day! I’m pretty busy writing screen stuff these days, but what’s next book-wise, I really don’t know. I’ve finished up everything I’m contracted for, so I’m going to hibernate and ruminate for a while and have a think about what kind of story I want to do next and what I want to commit the next few years of my life to. Will let you know when I do! MALICE, the movie! Directed by Michael Busheri, produced by Einav Yehezkeli, shown to you by kind permission of parents, cast and crew. It’s quite a thing. Comments welcome but keep ’em nice. This isn’t 4Chan, and I shoot trolls. Then splash acid on them so they can’t regenerate. Meanwhile, as far as the other movie goes, I’m prevented from going into detail about where it is in the process but at present we have a script that everybody loves and currently things are rumbling along well enough. As soon as there’s anything official to announce, I’ll announce it. Motoring through VELOCITY (the eagle-eyed there will spot a clue to the nature of this book…) and on course to deliver it by the end of the year for a June-ish release in 2015. I’d give you a blurb for it, but blurbs give too much away and I haven’t finished it yet and besides, it’s an author’s prerogative to keep secrets, because we’re all massively paranoid someone’s going to steal our ideas and write it before we do. Goodbye, summer! You were a good ‘un! 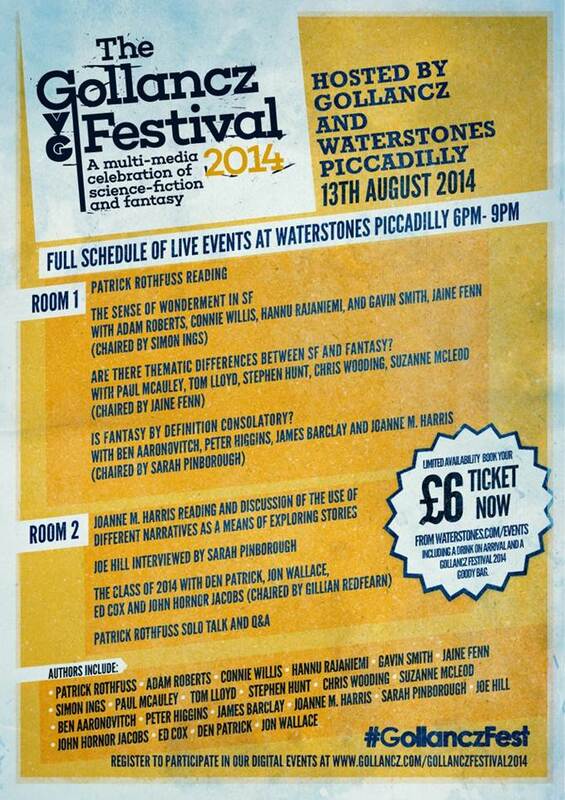 Gollancz are having their own mini-festival and I, of course, shall be there! Come by!